A DBS Debit Card Fraud? One of the most horrifying incident that have happened and never will you expect it to happen. Everything happen within minutes and my DBS bank account was almost emptied. I have received 3 one-time verification SMSes from DBS Bank in order to facilitate some online transactions. This SMS required me to key in said passwords in order to facilitate some online transactions, but I had actually just woken up from my sleep at that point of time and have NEVER made any such transactions. Thus, I made a call to DBS to enquire about this issue but was informed that the transaction had been made overseas. When I updated them that the transactions were not made by me, they informed me that they could block the card but made NO GUARANTEES that they could stop the transactions from going through. Later that afternoon, I went directly to one of the DBS branch to check on my account but was shocked to discover about the missing monies. After lodging the complaint AGAIN, they revealed to me that my money have been transferred to 8 different accounts that morning; and these agencies shared the SAME account number! To clarify, I did not use my card for any online transactions neither did I lose my debit card before. Call yourself Singapore’s most renown bank, I have simply lose all my trust in this bank. Why could this fraud happen again and again after years? IF I haven’t authorize any transactions from my one-time password received, why did those transactions go through? Please share this piece of information and CHECK on your account DAILY! 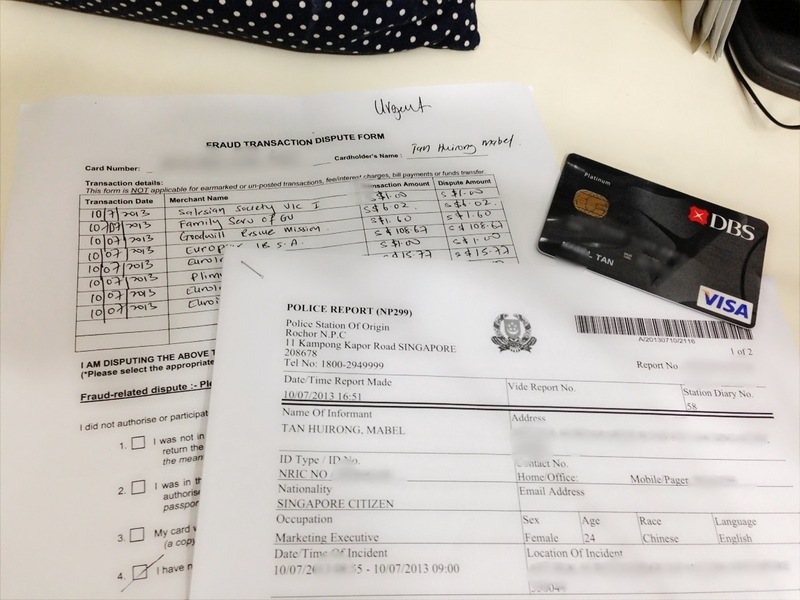 This entry was posted in Money and tagged DBS, Fraud, Money Issue by Mabel Tan. Bookmark the permalink. I’m a reporter following up on this case as there have been reports of other such incidents as well. Can please email me your contact details? Hi, Do you get your money back? Oh dear.. After the whole scam incident, I did make calls to the bank and they did a refund for the money loss within a few days. Do call the bank to inform and make a police report thereafter. I hope you will get your money back soon too.